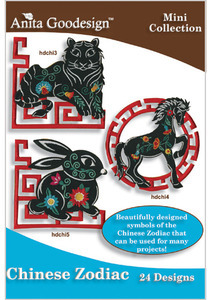 This collection contains 12 unique designs symbolizing the 12-year cycle of the Chinese Zodiac. We added beautiful flowers and swirls to the designs for a creative look. Each of the designs comes in two different sizes 4”x4” and 5”x5”. For our project we created 12-block quilt using cotton and cotton batik fabrics. The end result is truly stunning.